Meet your neighbor Jake Snelson from La Harpe. Jake was born and raised in Hardin and graduated from Hardin Calhoun High School in 1959. In December of 1959 he married Mary Webb and moved to Kirkwood, Missouri. While in Kirkwood, Jake worked for Tom Boy Grocery. In 1960 Jake and Mary moved to Grafton where he was employed as a farm hand. In 1961 Ron Morris, who ran Cortelyou Feed and Seed, here in La Harpe, called Jake and wanted him to come to work for him. Since coming to La Harpe, Jake has also worked at J.I. Case, Burlington, Iowa, and in 1972 started working for the City of La Harpe as City Deputy. Jake retired after 33 years and 10 months. 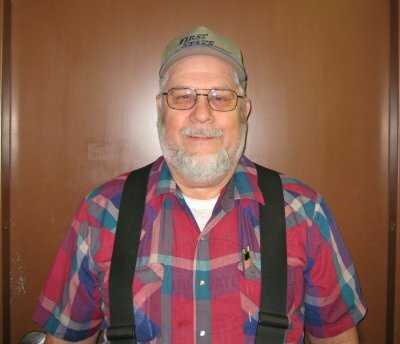 Currently, Jake is a part time courier for the First State Bank of Western Illinois, here in La Harpe. He and his wife Mary have three children, Kevin Snelson, Jerry Snelson and Debra Johnson. They also have 7 grandchildren. Jake has given to this community not only as City Deputy, but he was an assistant Scout Leader and a Scout Leader for the Boy Scouts. While being a Scout leader his son, Kevin, earned his Eagle badge. Two of the most memorable times that Jake can recall, while working as a City Deputy, were getting his picture taken with two of the high school classes for the year book, and in the winter time he cleaned snow and ice off cars for the assistant nurses aides at the nursing home. Jake said, "I had a great time with the kids, that was fun. And the nurses would bring me cookies and cakes to thank me for cleaning off their cars. That meant a lot to me." Jake enjoys going camping, fishing, and spending time with his family.